The TR-Motorsport (TRM) team ventured to Malaysia for the first round of the Thailand Super Series 2018. A very hot and humid Sepang Circuit greeted the team as they arrived early in the week to begin their preparations. 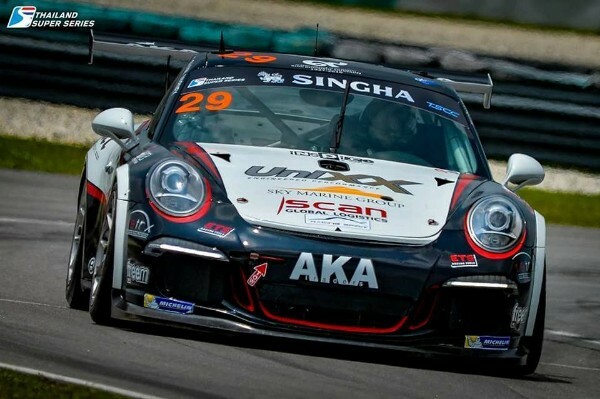 With the new 2018 Porsche still being prepared in Bangkok, the team rented a 2014 Porsche 911 GT3 Cup Car, the car was in prime in condition, however, the team had no prior setup information to benchmark against nor did they have any experience in this type of Porsche. The first two races of the season were each one hour long with two drivers for each race. TR-Motorsport hired New Zealander Shaun Varney to co-drive with team owner Thomas Raldorf, as Shaun had not raced at Sepang before he was given the task of taking the car out for the first practice sessions on Thursday. Friday’s sessions were shared between Shaun and Thomas who both struggled to find the best setup, it wasn’t until the Saturday morning session that the improvements started to come. Before the qualifying session, the team sat down with Porsche Academy driver and friend of TR-Motorsport, Will Bamber. Will reviewed the onboard footage and gave his insight into where the drivers could improve and gain a few more tenths. The advice from the PCCA driver proved invaluable as the drivers set their best time with a 2.11:5. The time was enough to secure 5th place on the grid for Race 1 and 4th on the grid for Race 2. Shaun took control of the Porsche for stint one in Race one and when the mandatory pit stop and driver change was over the team were sat in 4th but quickly gained 3rd place as Thomas began his charge around the 5.5km circuit. The B-Quik Racing Porsche was in 2nd place when it suffered a mechanical failure and retired from the race, moving Thomas into 2nd place. The lead Toyota had an unlucky first race as they were penalised twice for speeding in the pit lane, after serving both penalties they were out of contention leaving Thomas with an open track ahead of him and a comfortable stroll across the finish line to take maximum points. For Race 2 the team began in 4th and made a steady start consolidating their position, due to the previous day’s success penalty time was added to the mandatory pit stop and driver change which amounted to over two minutes that the Porsche had to remain stationary in the pits. This made a challenge for 1st place nigh on impossible, but Shaun who was in the car for stint two did not give up the chase. Shaun was pushed all the way by the revitalised Alif in the B-Quik Racing Porsche to make it a tense finish, but the Kiwi driver held his nerve to bring the car home in a very commendable 2nd place just 0.3 seconds ahead of Alif. The team are now tied with Toyota Motorsport in both the Drivers and Team Championships on 35 points each. A great start to the new season for TR-Motorsport who are now competing in the GTM Supercar Class. The team will be next on the track for the Round 2 of the Thailand Super Series at the Chang International Circuit in Buriram on the weekend of 2nd & 3rd June.